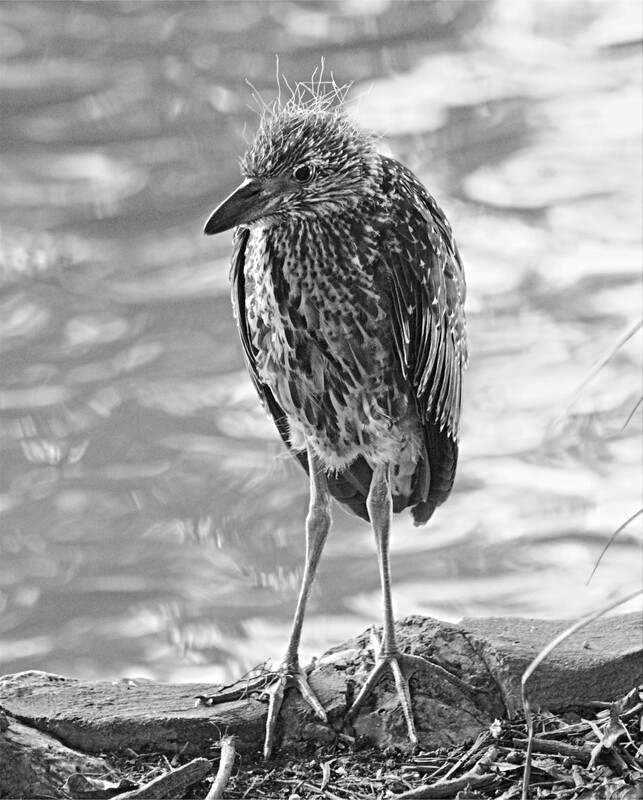 This week, Cee is looking for birds for her Black & White Photo Challenge. We saw plenty of birds while we were in Texas! In fact, while we were in San Antonio, one of the biggest challenges for me was visiting the Riverwalk which was lined with birds. If you are a regular reader of this blog you will know about my life-long fear of birds and the problems that I have, dealing with them in everyday situations. After the first few minutes of dodging pigeons along the pathway I was almost tempted to give it up and return to street level but with the help of my husband, who walked ahead of me, as a kind of anti-bird bodyguard, I managed to stay the course for quite a distance and I was glad that I did. There is so much to love about the Riverwalk! However, it’s not all fun and games on the river. This young bird (heron?) was standing alone on the banks of the Riverwalk. He was quite unconcerned that we were so close. I guess he must have become used to people walking by and the boats packed with tourists going up and down the river. I’m no bird expert so I couldn’t really tell how old he was but I hoped that he was capable of taking care of himself as, when we walked back on the other side of the river, we spotted an adult heron floating dead in the water just opposite to where he was standing. Great photo Sue. Poor thing looks like he is having a bad hair day. Hope he is old enough to fend for himself. Thanks, Jane! Yes, it was the ‘hair’ that got my attention. Hopefully he will survive, although it did seem rather a strange place to find this kind of bird. Reminds me of when the kids would rub a balloon on their heads to make their hair stand on end! A scruffy little fellow. Looks to be old enough to get by on his own. I hope so! It’s a tough world out there. Great photo capturing all those feathers and sticky up hairs. He’ll be fine…he has that twinkle in his eye! I think you’re probably right, Marianne. He may not be as silly as he looks. A lovely picture. I hope that the bird survived. Thanks, Tom! I hope so too. The little guy sure does look forlorn. Hope things worked out for him. The Riverwalk is a busy place. Perhaps someone took him under their wing. He does look rather bewildered by everything. Very good capture. Great details. He looks young, doesn’t he? If that was his deceased parent in the water, he should have another parent to feed him… hopefully! Thank you, Annie! Yes, that’s a good point. I certainly hope he’ll be ok. This is a beautiful photo, it’s a sad backstory though. Hopefully, things will work out ok. Thank you! At first I was happy that I’d had the opportunity to capture this image but then, later, I couldn’t help thinking about this little guy and hoping he was alright.